In 1936, George Agnew was arrested for passing a bad check to a woman on the corner of Bridge and Shenango streets. 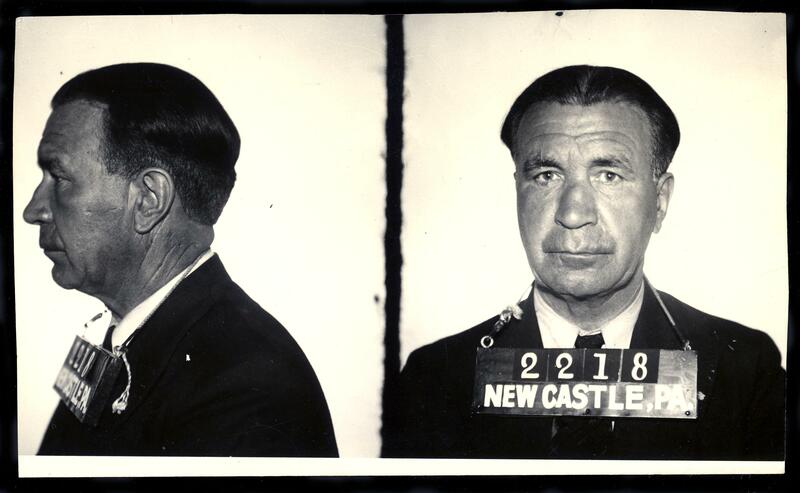 He gave a false name—Sam Stein—but was recognised by an officer who remembered him from an extortion case in 1931. In February of that year, two years before the repeal of prohibition, state police officers had raided the home of Anna Aceta, on South Mercer street, on a liquor warrant. The woman surprised them by complaining that she’d already paid protection money to the police and saying that they ought to leave her alone. After an investigation, George and four other men, including Robert Glass, a deputy constable who ran a paint shop in Ellwood City, were arrested and charged with extortion, blackmail and conspiracy to cheat and defraud. George and Robert’s plan had been straightforward. On December 11, 1930, George’s nephew, Harry, knocked on Mrs Aceta’s door and asked if she had anything to drink. She took him inside and sold him a pint of whiskey. As soon as the money changed hands, George, Glass and two other men burst in, shouting, “Police! This house is under arrest!” They showed Mrs Aceta and her son and daughter some papers, which they said were a search warrant. Harry Agnew pretended not to know them. He demanded to know what was going on, before falling silent when Glass found the whiskey bottle hidden in his coat. Glass handed a gun and blackjack to George Agnew, saying, “If they get hard, you know what to do”, and the men proceeded to search the house, finding more liquor. Glass told Mrs Aceta that she could either go to jail or pay an immediate fine of $100 or so. Mrs Aceta gave him everything she had on her—$26. The men drove her to her eldest son’s house, where she borrowed $7 more. The next day, Mrs Aceta got $80 from her sister and gave it to the men when they stopped off at the house. As she handed over the four $20 bills, her daughter asked to see the search warrant. “We don’t have it with us,” Glass said. “Then let me see your badge,” she said, and Glass showed her his deputy constable’s badge, which struck the girl as odd, as the other men had called him “sergeant” throughout the raid, but she said nothing—until the night the house was raided by the genuine state police. All five men were found guilty. George and the other civilians were fined $25 and given two months in the county jail. Robert Glass was fined $500 and sentenced to a year in the Allegheny workhouse, because of the abuse of his badge. Anna Aceta, the woman who had helped to bring the corrupt official to justice, was found guilty of the illegal sale of liquor, fined $100 and paroled for two years. When George was arrested in for passing a bad check, in 1936, he was sixty-one years old. There is no record of the outcome of the case. Sources: New Castle News (28 Feb 1931, “Woman Asserts Hush Money Paid To Trio”; 5 March 1931, “Grand Jury Returns Many True Bills”; 18 March 1931, “Court Hears Testimony In Alleged Fake Raid By Deputy Constable”; 19 March 1931, “Deputy Constable Glass Denies Being Party To Fake New Castle Raid”; 28 March 1931, “Officer Is Sentenced”; 9 Sep 1936, “Arrest Agnew On Charge Of Suspicion”). “George Agnew” sounds like it might once have been a Greek name. Not that Greeks are any more likely to be criminals, of course.